Pretty obvious at this point I’m loving my Traeger, right? 🤣 It’s like having an extra oven right in the back yard. You know…. one that I don’t have to take care of or stand over or stir things since it’s Jason’s domain – awesome! We’ve made so many amazing meals on our Traeger – Smoked Ribs, Easy Smoked Pork Loin and Smoked Brisket just sooo good!! Because the last recipe for smoking ribs that I shared was so popular, I thought it’s high time I shared another great pork rib recipe. I knew you’d agree! 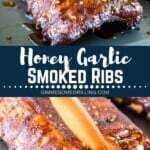 These honey garlic smoked ribs are epic. So much flavor and paired with a tender, fall off the bone rib. Epic. What is silver skin? Why and how do you remove it? 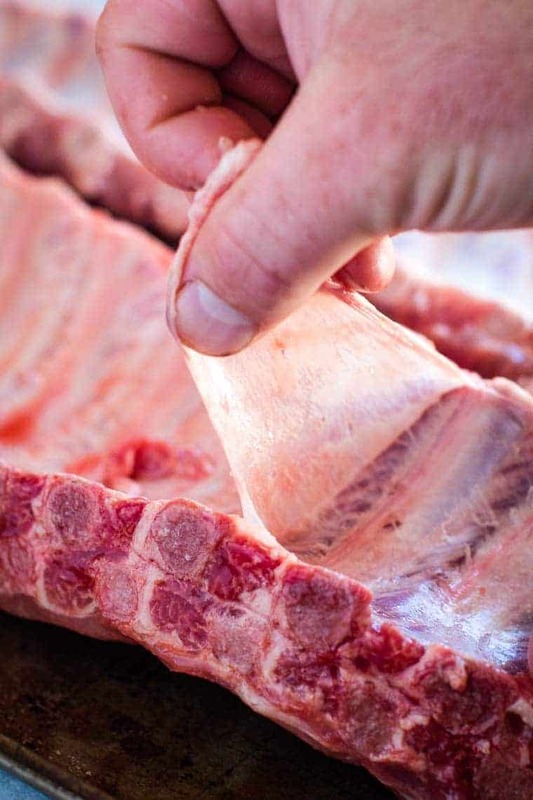 Pork ribs have a thin membrane (silver skin) on the back of the ribs. It can easily be removed by carefully sliding a knife between the skin and bones, then simply grab the edge and peeling it off. It may take a couple of tries. If you don’t remove it, your ribs won’t be as flavorful, plus they will be chewy. The skin creates a layer that stops the rub from flavoring the meat. It’s an extra step, but totally worth it! 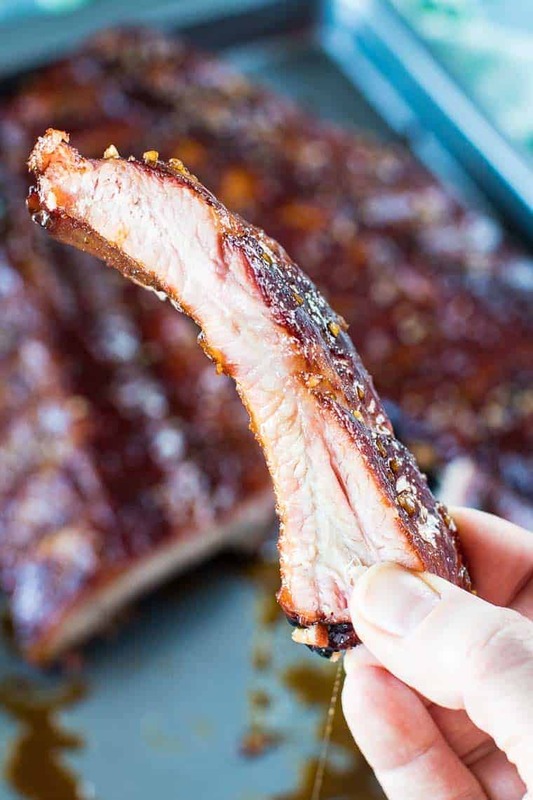 We love using the 3 2 1 rib method because it’s easy and everyone can achieve delicious ribs off their smoker with this method. 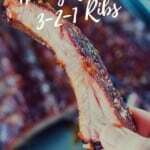 What is the 3 2 1 Rib cooking method? 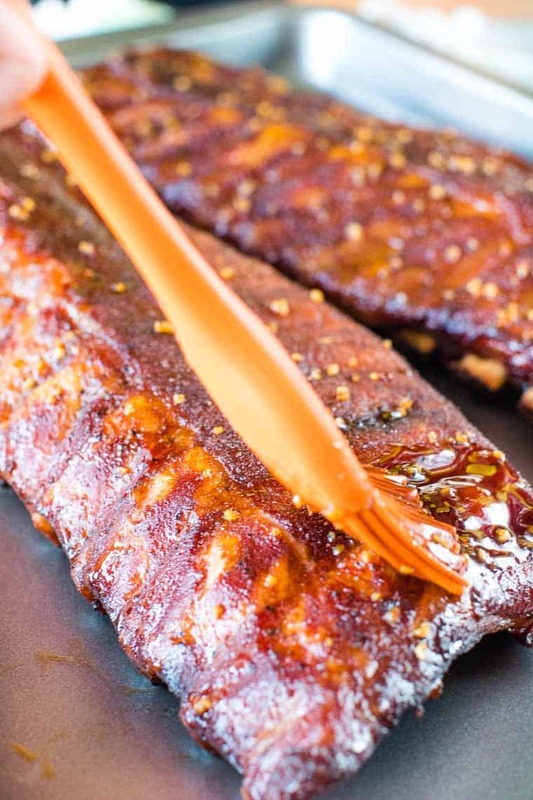 This is a method to cook ribs that breaks it into the 3 time blocks – 3 hours of smoking unwrapped – 2 hours of cooking wrapped in foil and one hour of cooking unwrapped basting with barbecue sauce! This is a tried and true method that results in fall-off-the-bone tender ribs! When we first bought our first smoker I was a little overwhelmed at the idea of smoking ribs because of the time involved and the fact I thought it was complicated after watching shows on TV with professionals! Using the 3 2 1 method it’s totally approachable and you get delicious results everyone will love. Don’t be overwhelmed at the thought of smoking ribs. This recipe is straightforward and easy, but give you an amazing result. This is the BEST method for tender, flavorful ribs! It takes six hours. Yes, that’s a bit of time, but it’s a great recipe if you are around home on the weekend and have some time. Plus, it’s totally worth the time invested. These are BETTER than a restaurants! Combine the rub for the ingredients and spread of the ribs. Wrap in plastic wrap so they are completely covered and refrigerate. Prepare your smoker to 225 F degrees. Remove the plastic wrap and place the ribs on the smoker bone side down. Let smoke for 3 hours at 225 degrees F.
Mix together apple juice and water in a spray bottle and spritz ribs every half hour. After 3 hours remove ribs from smoker and lay on tinfoil. Mix honey and apple juice in a bowl and pour over the ribs. Seal the ribs carefully so the sauce doesn’t escape! Place ribs back on the smoker for another two hours. While the ribs are smoking prepare the honey garlic sauce. After 2 hours remove the ribs from the smoker. Remove the ribs from foil. Coat ribs with honey garlic sauce and place back on the smoker for 1 hour. Brush with sauce just prior to serving. Dinner Rolls on Smoker – I love these rolls! Grilled Corn on the Cob in Foil – big fan of corn on the cob, how about you?!! Grilled Caesar Salad – love the flavor you get from grilled romaine lettuce. S’mores Banana Boats – because these are just fun!! Snap a photo and be sure to share your ribs on Instagram! 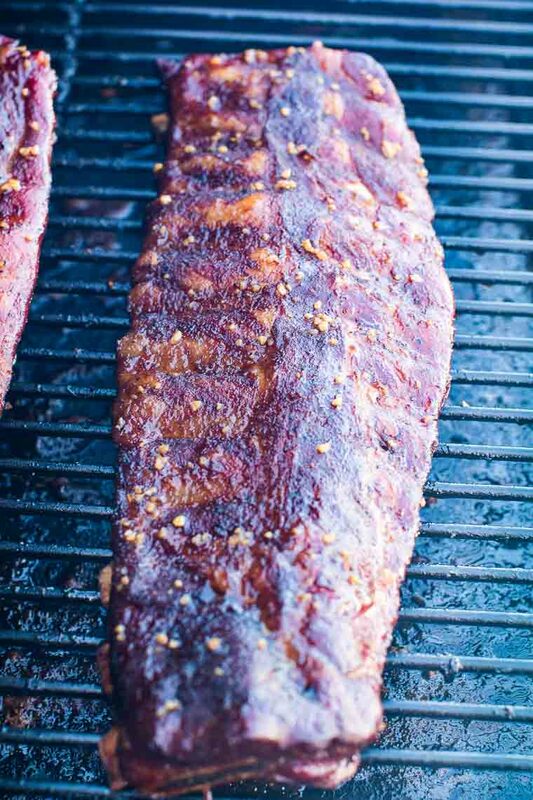 Don’t forget to tag me @gimmesomegrilling or #gimmesomegrilling – I can’t wait to see how these turned out for you, I know you’ll love these ribs! 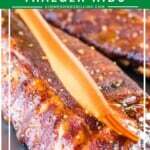 Tender, fall off the bone smoked ribs recipe made on your Traeger pellet grill using the 3 2 1 method with a honey garlic sauce! In a small bowl combine the ingredients for the rub. Spread the dry rub over the ribs covering them completely. Wrap in saran wrap so they are completely covered. Place in fridge for a minimum of 2 hours, but we recommend doing it overnight. Prepare your smoker according to manufacture's directions to a heat of 225 F degrees. 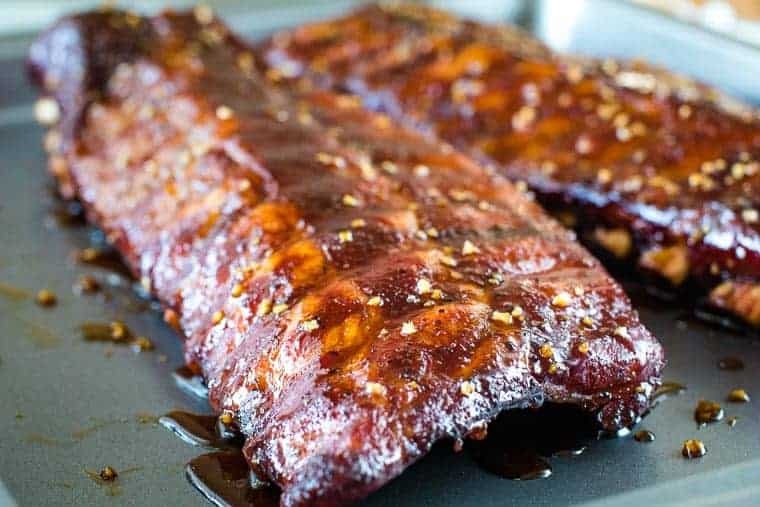 Once the smoker is preheated to 225 degrees F place ribs, bone side down, on the smoker and let smoke for 3 hours at 225 degrees F.
Mix together 1/2 c. apple juice and 1/2 c. water in a spray bottle and spritz ribs with mixture every half hour. After 3 hours remove ribs from smoker but leave smoke on at same temperature. Lay tinfoil out on counter (enough to wrap ribs in) and lay the ribs on the foil. Mix 1 c. honey and 1 c. apple juice together in small bowl. Pour it carefully over the ribs and seal up the foil so nothing leaks out. Place ribs back in the smoker at 225 degrees F for 2 hours. Meanwhile in a mixing bowl combine all ingredients for honey garlic sauce. After 2 hours has passed remove the ribs from the smoker. Remove the ribs from foil. Coat ribs with honey garlic sauce and place back on the smoker for 1 hour. Remove from smoker and brush with sauce again and serve! 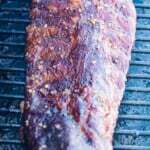 Fantastic recipe and the post is so detailed it answered legit all of my smoked ribs questions right off the bat! Thanks for the deliciousness! 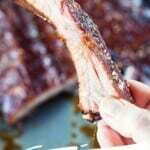 Great tips to ensure fab results smoking ribs! This really answers a lot of questions that anyone could come up with when making ribs. It’s great! And the ribs? Well they look divine! I have never made ribs before, but you’re making me want to really bad! These look so amazing! I’m glad you gave so many detailed instructions, because I would have had no idea! They are so good! You’ve got to make them! I don’t have a Traeger smoker/grill. Is there a way that I can do this in my Bradley Smoker? Of course! It will work in any smoker just follow the directions. The main thing is to preheat the smoker according to the directions of the manufacturer. Then the times and heat settings will all be the same! I think I would be licking my fingers clean after eating these ribs! 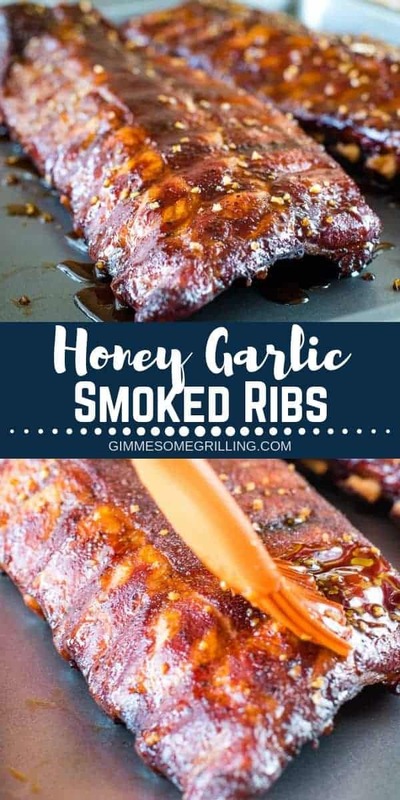 What an easy method to making ribs and that honey-garlic sauce sounds out of this world. 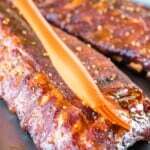 Great recipe that makes me confident I could cook these ribs myself. I did lick my fingers that’s for sure! Smoked ribs are one of our favorites and these were great! !